The Montgomery courthouse is staffed daily. All documents that are not subject to electronic filing are filed and maintained at One Church Street, Montgomery AL, 36104. The Dothan courthouse is not staffed. Filings are not accepted at this location. The Opelika courthouse is not staffed. Filings are not accepted at this location. 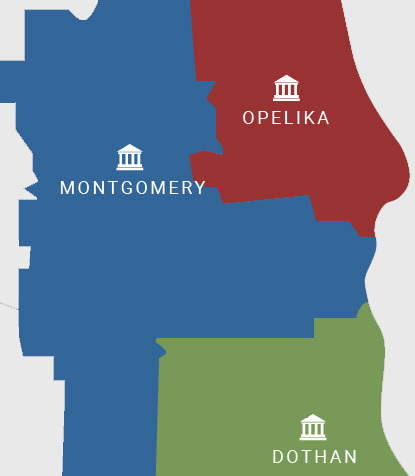 The Alabama Middle District has three divisions. The Southern (1) Division has a courthouse in Dothan, and is comprised of the following counties: Coffee, Dale, Geneva, Henry, and Houston. The Dothan courthouse is not staffed. The Northern (2) Division is serviced by the Montgomery Courthouse, and is comprised of the following counties: Autauga, Barbour, Bullock, Butler, Chilton, Coosa, Covington, Crenshaw, Elmore, Lowndes, Montgomery, and Pike. The Clerk’s Office is open daily in Montgomery. The Eastern (3) Division has a courthouse in Opelika, and is comprised of the following counties: Chambers, Lee, Macon, Randolph, Russell, and Tallapoosa. The Opelika courthouse is not staffed. From time to time, the Alabama MIddle District may issue an alert or notice deemed to be of high importance. This alert will appear in the form of a blue banner on our main page. The alert window can be removed by clicking the "x" in the top right corner. It will reappear every time you reload the home page. You may click here to view an archive of previously noticed alerts.